Published in the South Kent Gazette, 29 April, 1981. 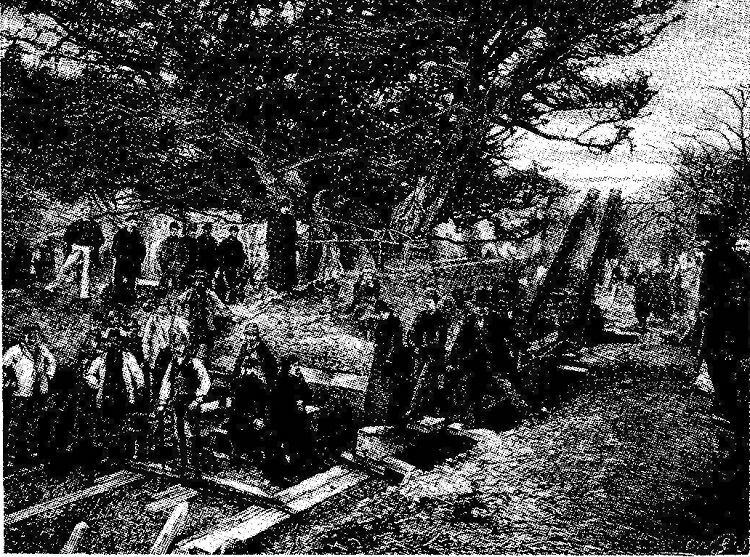 “As soon as the earth was bound together round the roots, the men began tunnelling under the tree making four “drifts“ from back to front, and into these drifts were placed four huge blocks or baulks of timber beneath which were some battens, and, between the battens and the baulks some six-inch rollers were placed. When these were secure, the earth was all cut away between the baulks of timber, and the whole mass estimated to weigh 55 tons was then resting upon the baulks on the rollers. The horizontal bough was propped up upon some heavy timbers placed on a timber dray. Above the place where the tree was to stand were placed three windlasses or crabs such as are used for drawing up the bathing machines on the shore, and from these crabs chains and blocks were fastened to a plank bolted on to the front of the baulks under the tree. When all was ready and the word was given to go, chain after chain snapped like tow, until, at last, some stronger tackle was procured, and then, on Wednesday, 3rd March, at about 5 pm the tree began to move when darkness set in and the work had to be suspended. Slowly, the next day, with a motion almost imperceptible, the huge mass travelled forward with many a stoppage and many a hitch, but before dusk, it had arrived within about a yard of its destination. “This yard was soon accomplished on the morning of Friday, 5th March, at about 9.30 am. Before the work of unpacking began some excellent photographs were taken by Mr Buckman, in two or three positions, and then the tree was slowly allowed to settle down into position. Turf was packed tightly in between the baulks, then, by means of powerful jacks, the baulks were raised and the rollers taken out. Then the baulks were drawn out backwards and the holes in which they had been were packed in with turf and soil and the whole banked up as it now stands. “It must not be supposed that this great undertaking was accomplished as smoothly and without accident as the description would seem to imply. One of the most serious difficulties which occurred was that just as everything was ready to start a rumbling sound was heard and a brick vault close against the trunk of the tree collapsed and, with it, a large portion of the block of earth on that side fell in. This alone was enough to daunt most people, but Mr Barron was equal to the occasion, and in an hour or two he had constructed a support to the cracked and cracking sides. Mr Barron is of the opinion that it was the digging of this vault, about one hundred years ago, which had caused the trunk of the tree to split in the manner in which we have always know it, as the builder had gone so close to the wood of the trunk as to cut asunder some very large roots, the wonder being that the whole tree had not fallen about his ears. Far from causing the death of the great tree the move seems to have renewed its lease of life. A century has passed since its removal, and, during that period, its vitality has certainly increased, the extent of its branches from north to south being now, at least, 6ft. further than in 1880. Yew trees are usually dioecius: the male flowers are borne on one individual and the female on another; but instances occur of flowers of both sexes being formed on the same tree, which is the case with this old Buckland yew, which some think accounts for its great longevity. The enlargement of Buckland Church, in 1880, was in accordance with plans prepared by Mr William Butterfield, of London, and the building was substantially carried out by Mr W. J. Adcock of Dover. The work consisted of an extension of the nave and aisles, which added three arches and piers on each side to the arcade of the nave, designed in the same style as the original work, giving to the church 250 more sittings. The north porch was removed from its old position to near the end of the new work, and at the west end was erected a new belfry tower in the same style as the original before 1851 alterations. The material used matched the old work, Caen stone in the interior, and Bath stone and flints for the exterior. The old flint work in the church, especially in the wall of the north aisle, is unusually good. The cost of the enlargement was £2,000. Two old monuments in the interior were put in corresponding positions in the new work. One is the memorial to Admiral Sir John Bentley, who died in 1772. It is a large mural marble slab, the inscription being surmounted by an unfurled flag and an urn. It is placed in the south-west comer of the south aisle; and the other is a memorial slab, near the bottom of the north aisle, to the Rev Alexander James, M.A., Vicar of Buckland, who died 2nd March, 1813, aged 88 years. He was at the same time Rector of Little Canfield, Essex. The recorded list of parish priests dates back to 1247. Since the extension a series of smaller alterations or improvements have been carried out. On the occasion of Queen Victoria’s Golden Jubilee, in 1887, the font of Cornish marble was installed. Three years prior to that the Willis organ was built. The attractive lychgate followed in 1891 and, to commemorate Queen Victoria’s Diamond Jubilee, in 1897, the wrought iron chancel screen, one bay west of the older, wooden one, was erected. In 1902, following the building of the ill-fated St Barnabas Church, on the corner of Cherry Tree Avenue and Barton Road, and the appointment of a vicar there, Buckland’s minister, the Reverend T. Evans, assumed the title of Rector. The choir vestry and the sacristy were built in memory of O. W. Clayton, in 1932, and this enabled the opening up of the south chapel, dedicated to St Thomas de la Hale, already referred to. St Catherine’s altar was also installed. 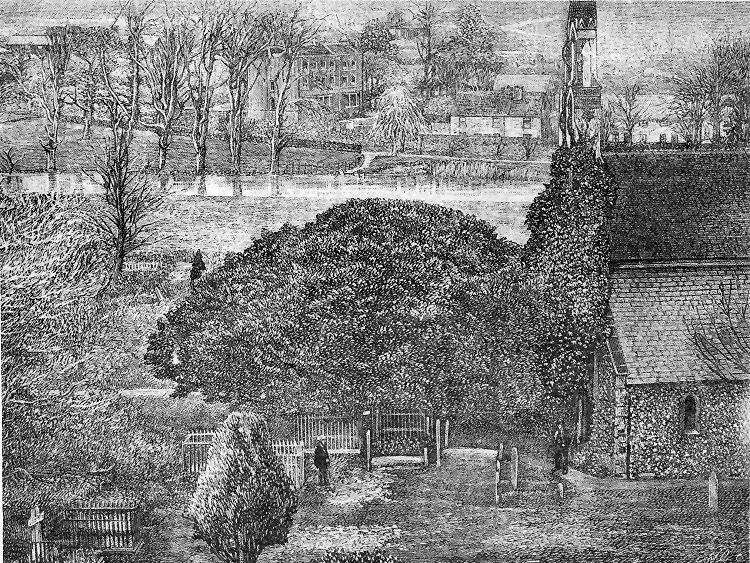 An artist’s impression of Buckland churchyard before the yew was moved to a new site. In reality the tree was not so close to the church. The engraving is interesting for its inclusion of Crabble water meadows and Buckland Paper Mill properties in the background. Both this view and that below, of the tree being moved, were published in the Gardeners’ Chronicle, in April, 1891, when tribute was paid to William Barron, the remarkable gardener who supervised the operation. He died earlier in 1881, aged 90. The picture above is based on a well-known photograph, the negative of which was owned by the late John Bavington Jones.